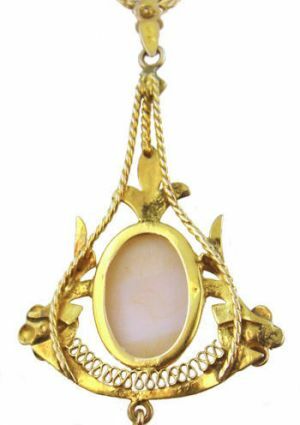 Description: An antique 10k tri gold filigree lavaliere necklace with an angel skin pink shell cameo and pearl accents. 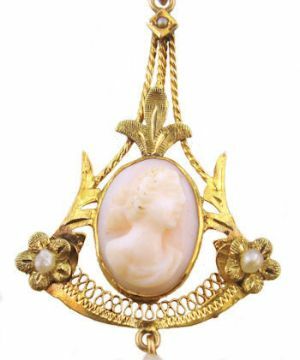 The 12.5x10mm oval pink shell cameo carving of a female profile. It is bezel set in yellow gold with applied green gold gold flowers and rose gold foliage. Each flower is accented with a tiny seed pearl. Completing the pendant is a Mississippi River baroque pearl dangle. Circa.1930's. Marked 10k on bail. The chain is a 10k .7mm very fine cable link chain. Measurements: The necklace measures 20" in length with the pendant extending 1 7/8" below the chain by 7/8" in width.